I had actually made dinner reservations for Monday evening, but I had to cancel them due to my ER visit. So I re-booked a table for Friday night. My first course, the Aloo Makkai Tikki, was beautifully presented and delicious. (Although I couldn’t pronounce it to save my life.) The little patties were the perfect size for an appetizer. 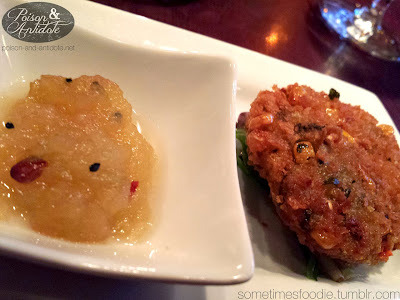 Everything was nicely spiced, and the sweet apple chutney added a beautiful, complex, flavor to the dish. 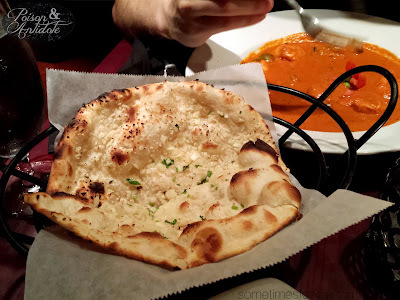 Although naan wasn't included with the meal, I had to order it. The Lasooni Naan is insanely garlicy, just look at it! You can see the garlic! 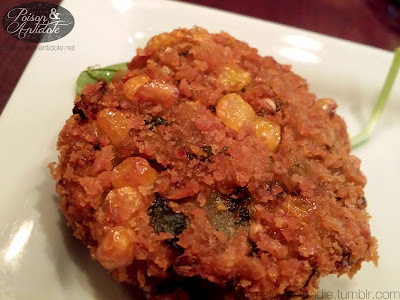 It's super yummy, although it might not be a great foodie option for a date night. 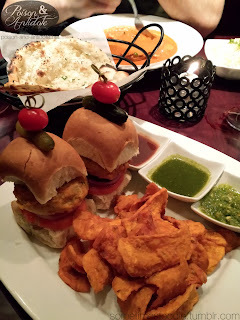 Next up was my main course, the Twin Bombay Burgers. I think a lot of you know this already, but beef isn’t a part of the Indian diet. (Even the McDonalds and fast food locations in India sell 100% veggie burgers.) These mini burgers are no exception, they are 100% beef free. The patties are made with potato and other spiced vegetables instead of meat, so the finished “burgers” have a creamy consistency inside and a fried, crisp, outside. If you like veggie burgers, you’ll love this dish. As a side dish you are given fried sweet potato crisps with three different dipping sauces. Two of the sauces were sweet but the green one to the far right was really spicy. My boyfriend enjoyed that one, but it was just too much for me to handle. This meal was delicious, but it was a little difficult to eat. The burgers were miniaturized, but each one was still very tall. I had a hard time trying to get all the flavors in one bite and would end up with a lot of the top bun left over. To finish things off I had the Banana Nirvana. There wasn’t a description of this dessert on the farm fresh menu, so I wasn’t sure what I would be getting, but the name sounded interesting. (Plus I am on a banana kick lately.) When the dessert arrived there was a scoop of homemade cinnamon ice cream in the middle and two little doughnut-like pastries. 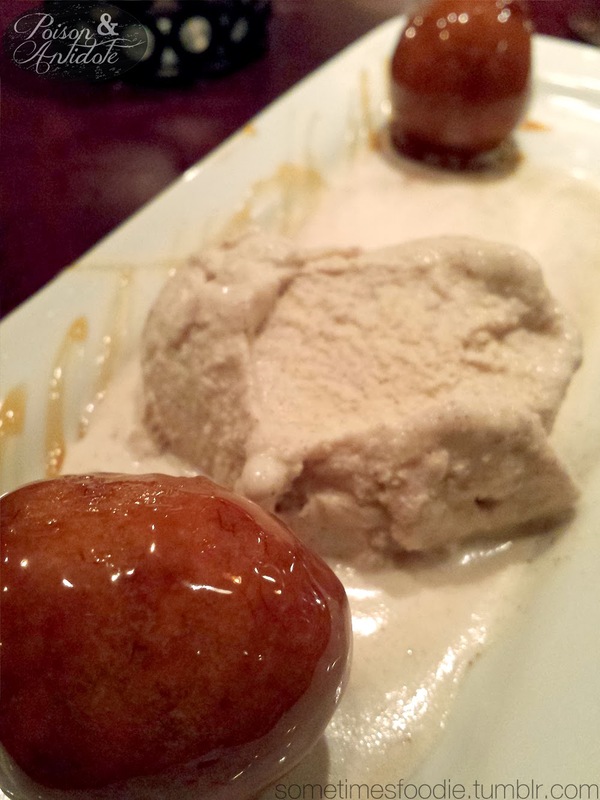 It turns out that this dessert is two, dense, banana-bread-like spheres baked in caramel. They were very moist and rich. I scrapped every bit of caramel and ice cream off the plate. It was so delicious. If you’re in the area I highly recommend stopping by IndeBlue and trying the farm fresh menu. It ends on the 31st, so go get some yummy food while you can!